Dr. Susan Yanoff graduated from Cornell University College of Veterinary Medicine in 1980. After three years in private practice, she joined the U.S. Army Veterinary Corps. While on active duty, she completed a 3 year residency in small animal surgery and became board certified by the American College of Veterinary Surgeons. She retired from the Army as a Lieutenant Colonel in 2004. After a year working on a horse farm in Idaho, she returned to Ithaca to work as a staff surgeon at Colonial Veterinary Hospital. She retired from Colonial in December 2009 and started working for SOS in January 2010. 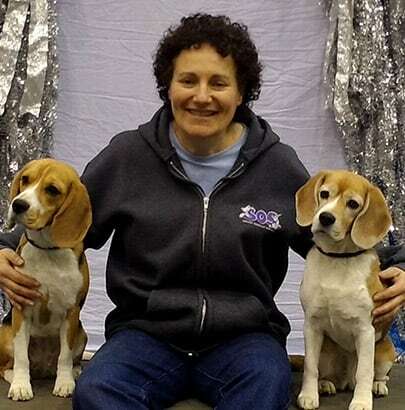 She also works at the Animal Performance and Therapy Center in Genoa, NY as a canine sports medicine veterinarian. She has two beagles, Charm (CH Wilkeep Third Time’s A Charm, UD, RE, MX, MXJ, AXP, AJP, TD) and Ivy (CH MACH Wilkeep Ivy League, CDX, TD). She trains and shows her dogs in breed, obedience, agility, and tracking.